Royal Magazine: WTF is happening??!! Ok. This is VERY wierd. Stardoll deleted the most popular clubs on stardoll, like, Eternity, Style_Magazine, BBOF, MadMacMom Designs. And Im now a member at Paulina Parizkovas club, Elites, but I never been a manager at AskPaulina club!! 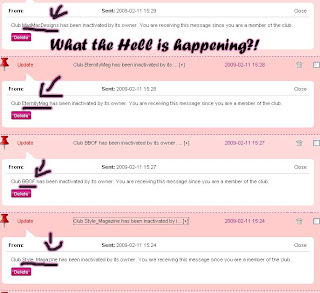 well if you add it all up, the owners of all those clubs have written a part of The Stardoll Magazine so maybe Stardoll is saying if you are allowed to write in the mag, your clubs have to be deleted?